The Össur Rigid Dressing (ÖRD) immobilises, protects and controls post-operative oedema in the transtibial residual limb immediately following transtibial amputation surgery. Immobilisation and oedema control are achieved by providing a firm dressing formed to match the volume and shape of the residual limb. The immobilisation will assist in prevention of contractures by restricting knee flexion. Effectively constraining and matching the volume of the residual limb will prevent an increase in oedema following surgery. 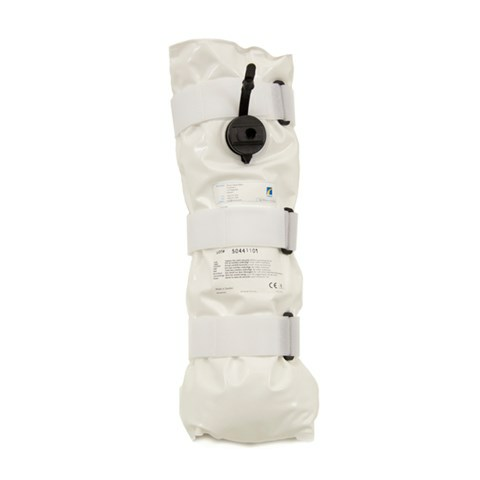 Containing the residual limb provides protection from discomfort, caused by bed trauma or possible falls during early rehabilitation. The ÖRD is made out of soft and pliable material and thus conforms to the shape of the residual limb. The dressing is made rigid by creating a vacuum in the internal chambers of the product. The ÖRD allows inspection of the residual limb during early rehabilitation. Easy to adjust for volume matching to the residual limb during post-operative use. After 5 - 10 days we recommend compression treatment using the Iceross® post-operative liner.